Telecom operators are going out of their way to promote 3G as users are still apprehensive about it. Their charges may be dropping but we all know that with 3G speeds getting things done faster, we are going to end up using the 3G data more and exceeding the limits too at times. 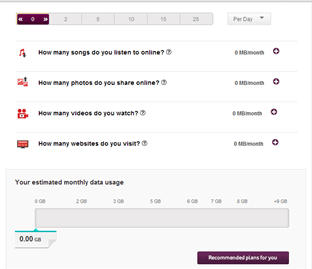 Vodafone has come up its 3G calculator which helps you determine your data requirement approximately based on your consumption and recommends plans accordingly too. We checked out other 3G calculators too but ended up liking this one the most. Let us explain it to you. Firstly you need to select the device you’ll be using 3G on: mobile or laptop. Next you need to mention if you are a postpaid or a prepaid user as plans tend to vary at times for these subscribers. Post that you need to fill as to how many mails you receive and send, how many songs you listen to over the internet, how many pictures do you upload over the internet in a day, how many videos do you watch and how many websites you visit. You need to fill in the approximate details of the aforementioned things on a daily basis. Now let us talk about what the competition has on offer. 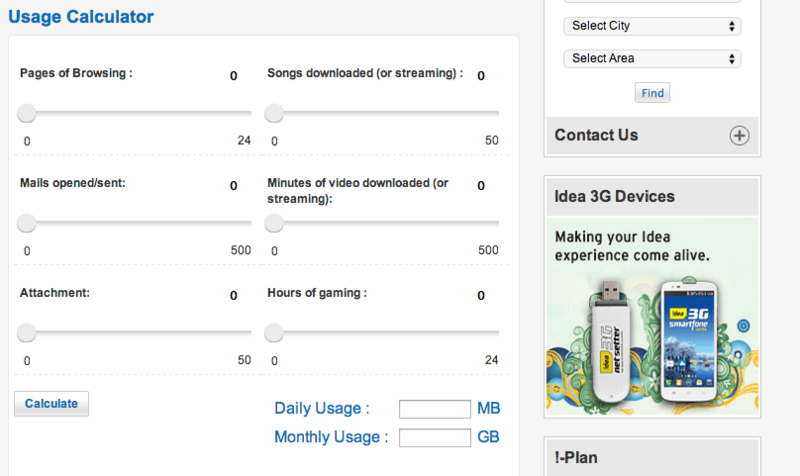 We visited Idea’s website and they have decently laid out 3G calculator too but it lacks a lot of functionalities it also does not recommend which Idea 3G plans will be best depending on the usage . It does not differentiate between laptop/mobile and prepaid/postpaid customers. It also does not give you recommendations based on your usage. When we tried out Airtel’s website, we could not find a 3G calculator (and it is the country’s biggest network). Last we remember, they had one on their site but it looks like it has been taken down. Tata Docomo has a similar calculator to that of the Idea but it again loses out against the Vodafone one. So there you go, Vodafone gives you the best 3G calculator and it surely is better than the rest. Idea Cellulars Easy Share Plan For Sharing Usage, Who Should go for it? Reliance 3G Data Calculator: Why is it better than the rest? Airtel my application includes 3G calculater…..